Optimize Azure license utilization with vScope 3.6. With Discovery schedules, you will be able to customize the inventory as you want it. vScope 3.6 comes with a new available product – vScope Cloud Spend. It introduces new resources to vScope including new Dashboards, analysis and Properties pages. vScope Cloud Spend aims to highlight the most important insights about your Azure licensing. Without any prerequisites, you will quickly be able to view reports about eg. license utilization and configurations to help you cut costs and ensure compliance. The new Properties pages serves as an automatic report about all License plans and provides you with all information you need to cut license costs. Instant access to valuable information about license configurations and utilization. 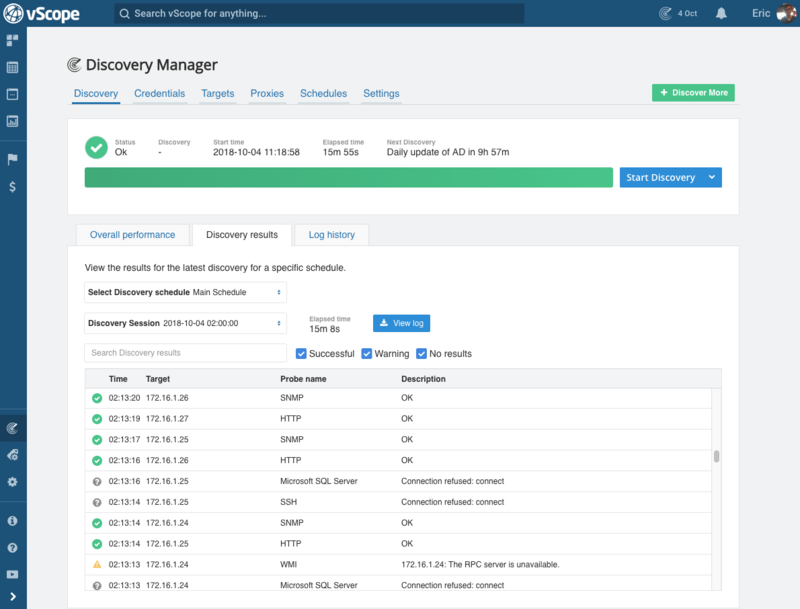 Discovery Manager has been completely redesigned and now offers much more flexibility and customization to the core feature of vScope – World leading IT inventory. With schedules you can make vScope scan any range or platform at different times during the day. Perfect for remote branches, multiple AD updates every day or just weekly inventories of larger networks. Make your Discovery run better with help of suggestions generated from your Discovery’s actual performance. Select Discovery schedule and a session to view detailed information about that discovery. With filters you will be able to quickly find improvements and misconfigurations. Smart Targets are designed to help you to faster increase the coverage of your Discovery scope. With help of smart algorithms vScope will now automatically classify targets (from eg. vCenter, Active Directory etc.) into various platforms. Assign a credential to these Smart Targets and let vScope do the magic for you. Smart Targets are marked Green in Discovery Manager. vScope 3.6 brings the power of relationships into the Properties page for virtualization hosts. Quickly find out any dependencies of other resources in your IT. Have a look at the latest dashboard. Designed for instant overview of your certificates. Include price items in a group offer by bundle any quantity. In the latest version of vScope Billing you can deduct costs from the billing summary by using the new bundling feature. Add custom skip lists to you Discovery scope including notes and what platforms to ignore during Discovery. Detailed view of what’s scheduled in the Main Schedule. The latest version of Properties page focus on highlighting important relationships. vScope now warns whenever a user makes a not very thoughtful decision eg. adding a very large range to the Discovery. It’s okay but you should know what you are doing. Due to the new skip list functionality we’ve also added support to bulk import skip list targets. Contact us for more information. Need to mention it at least. It is nice! A nice star for favouriting a Dashboard has been added.